Seriously, is this a sensible move? On the surface, that might make sense. Men are often physically stronger and a man attacking a woman in public is bound to try to quickly overpower their intended victim. Wouldn’t it be great to simply zap or spray them away? Violent men aren’t mosquitoes, though, and this problem of male violence against women is not so easily dealt with. I won’t lie, the thought of carrying these weapons makes me deeply uncomfortable. I am 100% in favour of self-defence lessons like the “grab-twist-pull” move I was taught in high school, but pepper spray and tasers??? It’s a bit like the flawed idea that more guns will somehow mean fewer shootings. Pepper spray and tasers for all sounds like a recipe for nothing but further violence. Opting out of that mix makes sense to me, but what if I was then attacked by stranger? Wouldn’t my lack of a weapon be yet another thing to add to the “List of Reasons it was Actually Her Fault”? Had a drink, wore a skirt, walked through a park, wasn’t carrying a taser? We aren’t just talking about arming women for self-defence, either. This law would mean potentially arming rapists, abusers and murderers, too. There’s nothing to stop them from using these weapons to incapacitate their victims. Statistically, men are at far greater risk of being attacked in public places by men than women are. Accessible weapons like this put them at risk, too. Would we see an increase in muggings, robberies and assaults? It seems all too possible and even likely. Have you guys really thought this through? There are so many problematic scenarios with this. Would we end up with a spate of lawsuits from men who were sprayed or tasered, claiming the women involved overreacted? Who would decide when the use of these weapons was appropriate and when it was not? What about deaths? Mr Bourman says these are “non-lethal” options, but that isn’t exactly true. In certain circumstances, both tasers and pepper spray can kill and have been associated with a number of deaths. What are the ramifications, both legally and personally, if a potential attacker dies? Some might believe that an attacker deserves whatever happens to them, but will that help their intended victim to feel better about unintentionally killing someone, even in self-defence? There seem to be so many potential consequences that Mr Bourman has perhaps not considered. He might have good intentions, but this is a bad idea. Stranger attacks on women in public spaces are certainly not unheard of, but statistics show that women are at greatest risk of violence in our homes, at the hands of current or former partners. 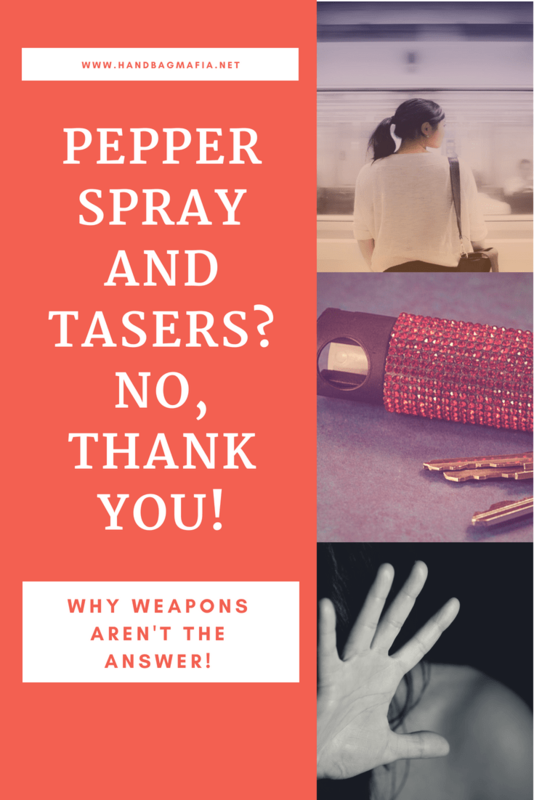 Are tasers and pepper spray appropriate inside homes? Must women carry them 24/7? What if children are present? Won’t abusive partners have the same access to these weapons? What we need is a combination of approaches to effect change. We can all serve the next generation better by being mindful of how we speak to children, ditching the idea that “boys will be boys” along with the trope that doing something feminine or “like a girl” is a bad thing, that women are lesser beings. There’s a lot of work to be done. We also need to discuss these issues without the defensiveness that so often rears its head. If you’re a man who doesn’t abuse anyone, don’t take phrases like “male violence” personally; it’s not aimed at you. Instead, listen to women. Address the men you know. The guy who makes sexist jokes shouldn’t be rewarded with your laughter or enabled by your silence, he should be asked to explain that joke. The mate who seems to hit on women that have maybe had a few too many shouldn’t have that behaviour accepted, he should be called on the fact that he’s chasing a woman who cannot consent. If your mate is cat-calling, harassing or objectifying women in any way, say something. Do you suspect he is hurting his partner? Then reach out and try to help. If you want to keep that “good man” title, just not being actively abusive isn’t enough. The other changes need to happen within a legal system where violent and sexual crimes against women seem poorly understood and aren’t taken as seriously as they should be. Light sentencing, poor conviction rates and complaints that never even make it to court because the process itself is so traumatic for survivors are all issues our current system isn’t addressing. Women are constantly reminded to be “situationally aware”. Our clothing, drinks, behaviour and even methods of transport are scrutinised in an effort to make male violence our responsibility. And now, there is this motion to arm us as well; another way to remind us that violent men are our problem. The fact that weaponising us is seen as a legitimate solution speaks volumes. No one wants to do anything to prevent men from becoming violent in the first place. And no one is interested in working with the ones that already are. Putting a motion through parliament and selling pepper spray and tasers might be easier than cultural change, but will it be more effective? I don’t think so. So, You Wanna Be A Prepper?